The process to find a Calgary wealth management firm or financial advisor in Calgary isn’t one most people take lightly. A Calgary financial advisor has a set of responsibilities to their clients that include not just selecting investments for them, but also ensuring they always put their financial well-being at the forefront of their decisions. A financial advisor in Calgary should be well-established and reputable, with a strong client base. They should also hold financial certifications, participate in continuing education programs to ensure they’re aware of regulations and best practices, and they should be transparent in their actions. Along with these criteria, we also take fee structure into consideration, and we weighted this factor heavily when creating the following ranking of the best financial advisors in Calgary. We prefer to rank Calgary financial planners who are fee-only. This means their advice is objective, and not related to an affiliation or compensation from a certain financial product or institution. With that said, there are also fee-based Calgary investment firms and financial advisors included on this list, but they were added with careful consideration to their other advantages for clients. No matter what your financial goals, preferences, or needs may be, this list of the top-rated financial advisors in Calgary can be instrumental in helping you identify the best firm to help you establish, build, and protect your personal finances. When it comes to choosing the best Calgary financial advisor, there are plenty of firms to choose from. With so many options to consider, how can you narrow the search? First, take a close look at what each financial advisor in Calgary has to offer, and match those services up with your own personal financial goals. As you will see in the following reviews for Calgary financial planners, each Calgary financial advisor specializes in varying areas of financial planning and wealth management. If your needs are of a broader nature and you wish to have peace of mind through simple yet comprehensive financial planning, you may be well-suited with a Calgary financial planner that offers a broader range of services. Once you’ve narrowed down your choices to a select few of these top-ranking Calgary wealth management firms, see if any of your selected advisors offers an introductory consultation session. Whether it’s a free or paid consultation, this can be a good way to “feel out” a prospective financial advisor in Calgary before committing to their services. 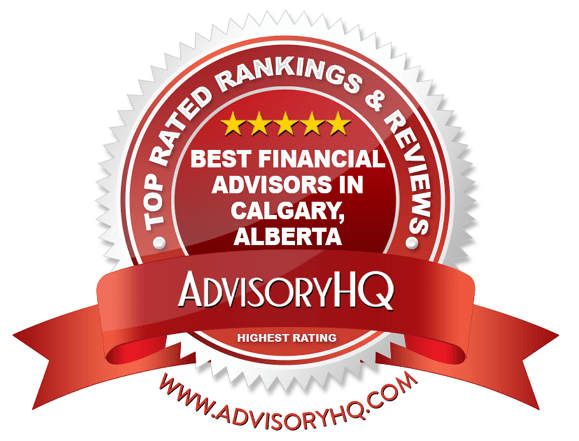 Below, please find the detailed review of each firm on our list of top advisors and financial planners in Calgary. We have highlighted some of the factors that allowed these Calgary financial advisory firms to score so highly in our selection ranking. Canaccord Genuity Wealth Management is one of Canada’s top independent, fee-based financial services providers, with two primary segments within the securities industry, which are wealth management and global capital markets. Since their founding in 1950, Canaccord has remained dedicated to the building of long-term client relationships. This Calgary financial advisor and wealth management firm also has offices in 12 countries around the world. Financial goals and needs are subject to fluctuate over time, stressing the importance of finding a Calgary financial advisor that provides a wide range of services. When partnering with a Calgary financial advisor from Canaccord Genuity, investors may potentially invest with federal, provincial, municipal, or corporate bonds. Other fixed securities include structured and floating rate loans, money markets, and guaranteed investment certificates. According to this top Calgary wealth management firm, these make good investment choices because they are more predictable than equities and are often paid out first in the event of company insolvency. As a top Calgary wealth management firm, Canaccord recognizes that mutual funds are liquid and diversified in nature, and often offer low minimum investment options. Specifically, a mutual fund is a professionally run bundle of varied investments. The diversity of investments helps limit risk in a volatile market. A Calgary financial advisor at Canaccord may potentially suggest an investment pool or structured product. These include a mix of equities and fixed income investments or other investments such as derivatives or hedging strategies. Canaccord explains that these offer further diversification and personalization of your portfolio. Small business and new company investments offered through this top Calgary wealth management firm can potentially offer higher growth potential, but this benefit also comes with a higher risk as these companies are less stable in the markets. With a wide range of investment management and financial planning options, Canaccord Genuity provides clients with a one-stop shop for a variety of financial needs and challenges. Each service offered focuses heavily on customization and getting to know the client’s unique needs, making Canaccord one of the best financial advisors in Calgary for new and experienced investors alike. 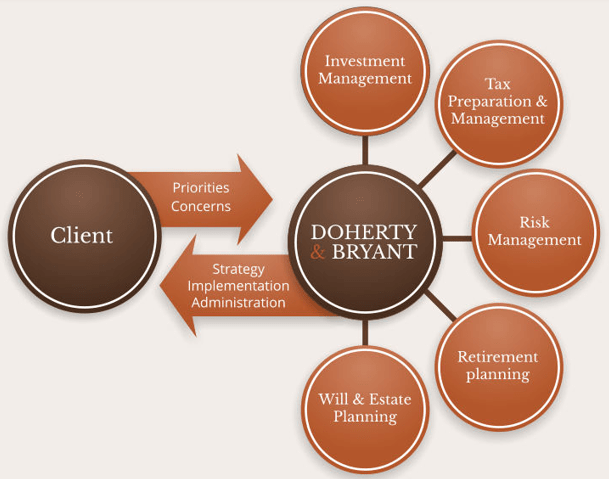 Doherty & Bryant is a financial advisor in Calgary that provides comprehensive wealth management and financial planning services. While we could not confirm whether Doherty & Bryant is a fee-only or fee-based firm, they do state that their process involves a “set dollar fee.” As always, we recommend verifying fee structure before partnering with any Calgary wealth management firm. Not only can the Calgary financial advisors at Doherty & Bryant provide personalized services to fit the unique needs of these client groups, but they also begin the advisory process with a complimentary, no-cost meeting, making it easy for potential clients to evaluate whether the firm will be a good fit for their needs. The team of Calgary financial planners at Doherty & Bryant includes senior and junior advisors, planning and administrative support staff, and contractual tax experts to provide services that are effective over the long-term. These designations come with strict requirements for fiduciary duties and ongoing education, ensuring that clients receive advice that is both up-to-date and truly in their best interest. For men, women, executives, entrepreneurs, and beneficiaries, Doherty & Bryant provides a comprehensive approach to address a wide range of financial challenges, laying a strong foundation for long-term relationships. With a talented team and access to an extensive network of financial professionals, Doherty & Bryant is one of the best Calgary financial advisors to consider partnering with this year. Founded by Jim Aronitz in 1993, Hemisphere Capital Management has become a successful Calgary financial advisory firm with over $350 million in assets under management and over a dozen employees. As a fee-based Calgary wealth management firm, Hemisphere advertises strong customer service in a personalized environment. Trust—This Calgary wealth management firm is in compliance with both the Code of Ethics and Standards of Professional Conduct and the Asset Manager Code of Professional Conduct of the CFA Institute. Macro Factor Analysis: This is the time where the team at this Calgary wealth management firm looks at broad issues impacting investors including global political, economic and social developments. Theme Identification: This step of the investment approach undertaken by this financial advisor in Calgary includes looking at investment themes, trends, interest rates, capital flows, yields between asset classes and more. Sector/Industry Considerations: Here, the team of Calgary financial advisors looks at specific sectors of the economy or individual industries that have favorable outlooks, and they also identify options with what they call a more “challenging outlook. Security Selection: This involves analysis at both qualitative and quantitative levels. 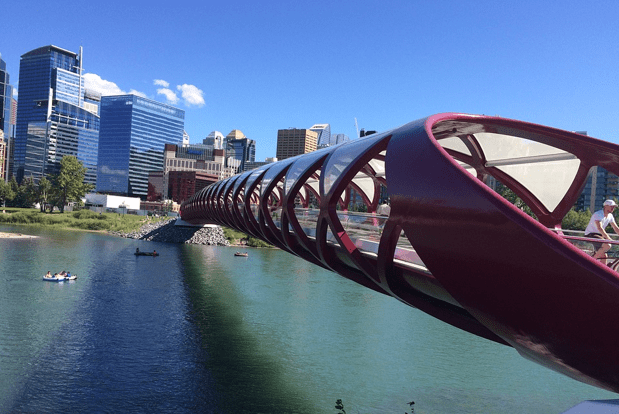 Buy/Sell Decision: When the team of this financial advisor firm in Calgary estimates intrinsic value, they then create what they call a range of fair value. Then, stocks that are trading below their intrinsic value may fall into various categories. 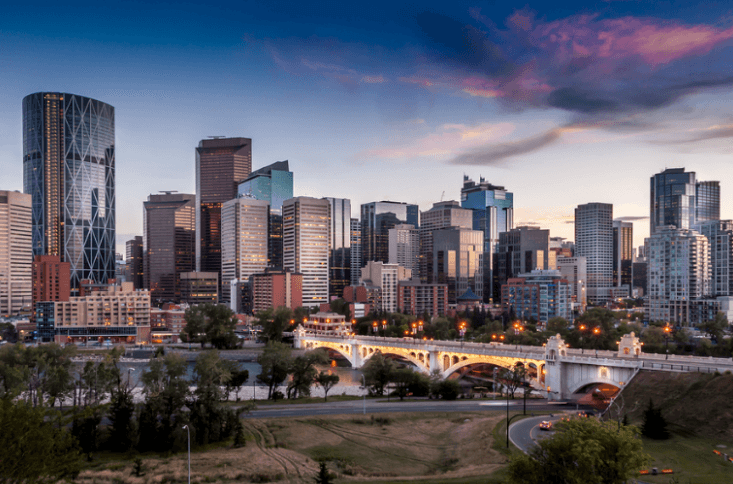 As one of the leading wealth management firms in Calgary, Hemisphere Capital Management places a strong emphasis on providing high-level client service and investment management over the long-term. With on-going communication, an experienced team of CFA professionals, and a detailed investment philosophy, Hemisphere is one of the best financial advisors in Calgary to consider partnering with this year. Founded in 1997, Integrated Wealth Management is an independent Calgary wealth management firm that strives to get to know clients on a personal basis, linking financial habits and actions with goals and dreams. This commitment to best serve their clients is reflected in their decision to limit services to a maximum of 125 families, making Integrated Wealth Management a boutique Calgary wealth management firm. As always, we recommend verifying compensation structure before partnering with any financial advisor in Calgary. Integrated Wealth understands that your finances are not the avenue to happiness, but merely part of a larger picture so that you can enjoy life to its fullest. As such, the Calgary financial advisors at Integrated Wealth will learn about your overall life goals and tailor your financial plan to achieve your desired outcome. This allows you to focus on what really matters—purpose, happiness, and family. The firm works with outside experts, like lawyers and CPAs, to offer a holistic, stress-free approach to wealth management. In this meeting, you’ll sit down with a Calgary financial advisor who will evaluate your overall “Life Goals” and begin to understand your lifestyle, personality, and values. An advisor will then create a report of your financial health and determine where you’re headed based on your current lifestyle. Integrated believes this presents to you a clear picture of your habits and financial routines so that you can more accurately determine what your goals truly are and if anything needs adjusting. Armed with the knowledge gained in previous meetings, your Calgary financial advisor then establishes a “Master Plan.” This report will establish a link between your financial lifestyle and your financial goals. After you decide you’re ready to move forward, your Calgary financial advisor will put the plan into motion. The correct outside managers will be hired, investments made, and outside connections such as accountants and lawyers established. Integrated advertises ongoing communication and customer service with clients. The firm offers scheduled face-to-face meetings, additional meetings in the event of unexpected financial changes, yearly reports, exceptional customer service, and on-going education in financial matters. With a focus on creating comprehensive financial plans through a deep understanding of life goals, Integrated Wealth Management provides clients with the unique opportunity to truly get to know their Calgary financial advisor, promoting trust and long-term relationships. For clients that want a thorough approach to both investment management and financial planning, Integrated Wealth Management is one of the top Calgary financial advisors to consider partnering with this year. Established in 1995, Networth Management has a long history as a leading Calgary financial planning firm. Networth specializes in helping their clients achieve their “true life goals,” based on a concept of values-based investing. Once these values are outlined, the team of advisors at this Calgary wealth management firm can help clients with the planning required to achieve those objectives. While we cannot confirm whether Networth is a fee-only or fee-based firm, Networth is fast to point out that they are not stock brokers, nor do they promote certain products. They are also not commission-driven, and they don’t see themselves as sales people. As always, we recommend verifying compensation structure before partnering with any Calgary financial planner. As a top financial planner in Calgary, Networth offers values-based financial planning because they seek to know your personal values and goals. The firm strives to offer financial peace of mind by helping clients to both achieve and sustain their dreams and goals. Networth also prides itself on recognizing the unique financial needs of women. They offer services filtered through a female-focused lens, rather than ignoring or denying the particular financial needs of women. As such, Networth may make a perfect match for you if you are looking for a wealth management firm in Calgary that acknowledges the particular needs of women. As a top Calgary financial advisor, Networth Management provides a wide range comprehensive services that are client-focused, providing a solid foundation for a positive, long-term financial planning relationship. However, in comparison to competing financial advisors in Calgary, Networth Management does have room for improvement in terms of how the firm’s capabilities are communicated. While some financial services are fully fleshed out, others are lacking in detail, which may make it challenging for potential clients to fully evaluate the firm. By adding additional details about how the firm can help clients with challenges—like Business Strategies and Succession Planning or Work Optional Goals—Networth Management could easily improve both their value proposition to clients and their overall rating as a top financial advisor in Calgary. Founded in 2011, Northland Wealth is a Calgary financial advisor offering over financial planning and portfolio management services in an independent, boutique environment. As always, we recommend verifying fee structure before partnering with any Calgary wealth management firm. Northland consistently highlights the fact that they have brought together a unique and winning formula of being a boutique firm, but with the advantages of a large Calgary wealth management firm. With over 150 years of combined experience, clients stand to receive a range of benefits from a unified, team-based approach. As a top Calgary financial planner, Northland seeks to integrate this approach in everything they do. Clients receive one-on-one attention from a primary relationship team, which consists of a Portfolio Manager and a Relationship Manager. This allows clients to benefit from strong relationship-building and deep financial expertise simultaneously, creating a solid foundation for long-term wealth management. With both investment and financial planning services, Northland Wealth Management provides clients with truly comprehensive wealth management. Additionally, all Calgary financial advisors at Northland provide individualized services from a fiduciary perspective, implementing professionalism, competence, good faith, honesty, integrity, and loyalty. With a strong focus on providing clients the benefits of both a large firm and a boutique Calgary wealth management firm, Northland Wealth Management is one of the best financial advisors for Calgary residents to consider partnering with this year. Perron & Partners Wealth Management is a financial advisor in Calgary founded by Gary Perron in 2013. With over 100 years of collective experience, the firm offers independent, unbiased financial advice to both individuals and institutions within the Calgary community. Our review was unable to confirm whether Perron & Partners is a fee-only or fee-based firm. As always, we recommend verifying compensation structure before partnering with any Calgary financial advisor. During the first meeting, your Calgary financial advisor will learn your unique needs and expectations. They will also explain Perron’s investment strategy and processes. Once advisors have learned about the current state of your financials, expectations, and tolerance for risk, they will begin the process of putting together your investment strategy. After the beginning stages of your relationship have solidified, Perron advisors will begin to educate you about the investment process. You’ll have the chance to ask any questions regarding investment decisions, implementation, and goals. Once you give the green light, your Calgary financial advisor will take action and put the investment plan into play within 90 days. The relationship doesn’t end once investment decisions have been made and the portfolio established, though. Going forward, you will receive updates from a relationship manager at least every 90 days. 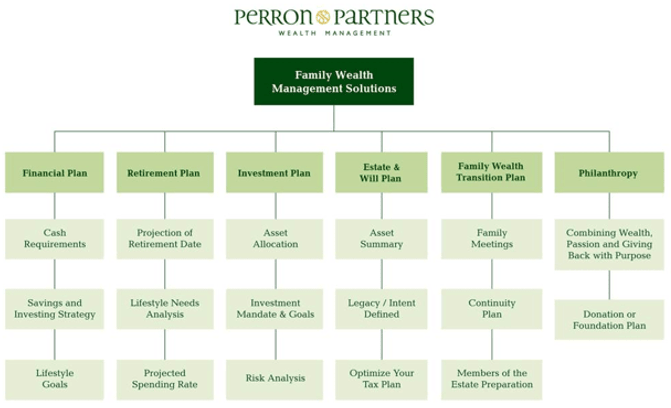 As an additional benefit, Perron has recently expanded their wealth management services, represented by the graph below. Perron is a fully independent Calgary financial advisory, and they define that independence as one of their biggest opportunities. They have a large platform, and are not held back by corporate directives, sanctions, or limited by in-house resources. This independence, combined with expert solutions for retirement, risk management, investments, and family wealth management makes Perron & Partners one of the best wealth management firms in Calgary to consider partnering with this year. Founded in 2010, RT Mosaic Wealth Management Ltd. is an independent, fee-only financial advisor in Calgary. With a focus on personalized service and exceptional performance, RT Mosaic provides portfolio management and financial planning as one comprehensive service. For many clients, finding the best Calgary financial advisor means finding a firm that is well-equipped to continue to serve their changing financial needs over the long-term. RT Mosaic also provides portfolio management that keeps balancing risk and reward, market timing, and diversification as crucial components of success. Although the team of Calgary financial advisors at RT Mosaic may be smaller than that of competing firms, this boutique structure offers clients the unique advantage of one-on-one advisement and relationship-building that larger firms often cannot provide. As a top financial advisor in Calgary, RT Mosaic Wealth Management Ltd. provides their clients with a wealth of advantages, including the transparency and unbiased commitment that naturally come with a fee-only pricing structure. 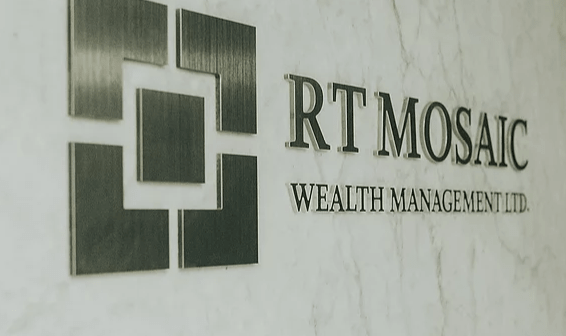 With comprehensive financial services and led by a team of highly accredited advisors, RT Mosaic Wealth Management Ltd. is one of the best financial planners in Calgary to consider partnering with this year. Founded in 1999, WealthCo is a financial planner in Calgary offering wealth planning, investment management, and risk management services. Operating on a fee model based on assets under management, WealthCo offers a wide range of skills as a top Calgary wealth management firm. Bonds: Bonds are seen as the conventional counterweight to investing in securities, and they tend to protect portfolios in the event of market downturns. Real estate: The team of WealthCo believes one of the missing components from many portfolios is real estate. They believe that directly-owned real estate also serves as a good protection against market down times and declines. Tax efficiency: According to WealthCo, another common weakness they see in many portfolios is a lack of tax efficient planning and strategizing. As a top financial advisor in Calgary, WealthCo boasts client-centric wealth planning, deep investment expertise, and an impressively designed website, setting the firm apart from competing Calgary wealth management firms. While WealthCo certainly provides clients with a strong wealth management advantage, clients may find it difficult to evaluate the firm’s full range of credentials and capabilities. Information on the industry accreditations and experience of the WealthCo team of advisors is not accessible, which could put WealthCo at a disadvantage. By adding detailed information about the experience and credentials of their advisory team, WealthCo could easily improve both their value proposition to clients and their rating as a top financial planner in Calgary. With so many firms offering financial planning services, it can be challenging to choose the right one—after all, the decisions that you make with a Calgary financial advisor will affect both you and your family. You don’t want to give this responsibility to just anyone. It needs to be someone you can trust. All of the Calgary wealth management firms on our list bring high-level skills and experience to the table. 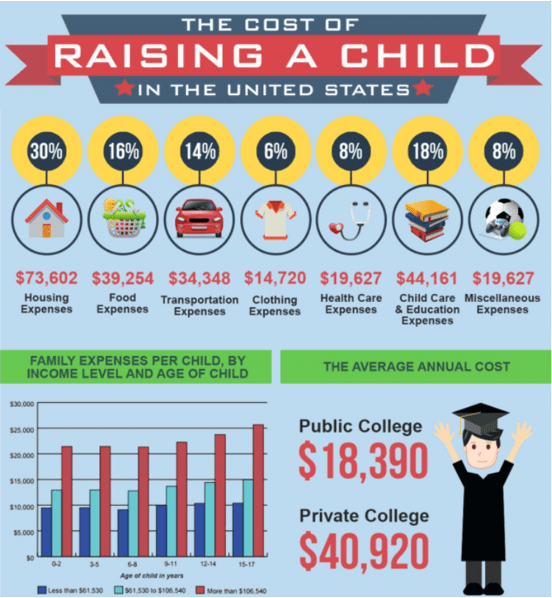 However, the firm you choose depends on your individualized lifestyle and investment needs. Be sure to read carefully and do your own research so that the firm you choose aligns with your personal beliefs, values, and financial goals. Most firms offer a free consultation, so you can do further research and set up an initial face-to-face meeting with a “short-list” of firms before finally settling with an advisor.